The office is one place that is always in need of great organizational tips. Why not create a place in your office for your daily schedule and for organizational binders holding specific categories. The chalkboard makes a great daily schedule tool. The binders are from Staples and are standing in a kitchen baking sheet organizer. 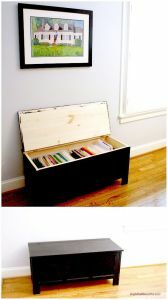 Why not create a filing trunk. Just repurpose an old trunk to hold all your files. When you are done, just close the lid to hide it all, and use the top for a seat. Of course, it goes without saying that desk drawers must be organized to save time and money. These holders and boxes are from the Martha Stewart’s home office organizing collection. 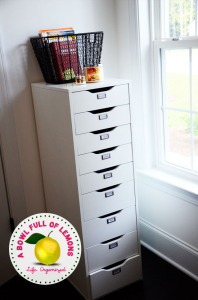 But you can just repurpose old jewelry boxes or dollar store boxes of different sizes and shapes. No need to spend too much! 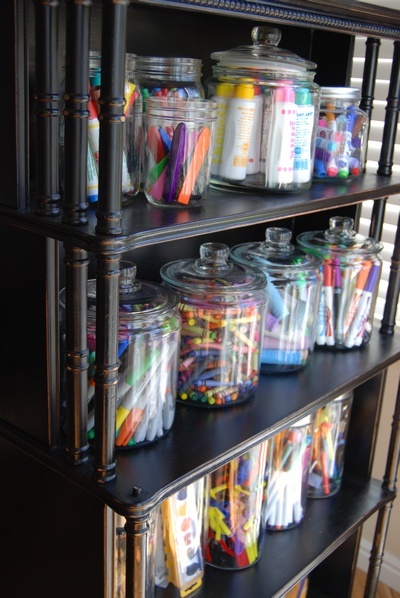 Organizing your arts and crafts supplies doesn’t have to be dreary. Use pretty jars and crocks on shelving to organize all those markers, chalks, colored pencils and paints. Be on the lookout for jars and crocks at yard sales, estate sales and thrift stores. Thanks to a Bowl Full of Lemons and The Idea Room.net for all the great tips!